List 3 ways we can set a godly example in our conduct. 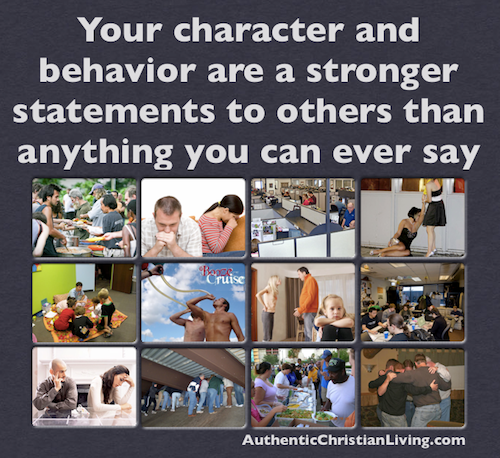 "Conduct is how you behave in front of others. Character is how you behave when no one is around"
-being humble. Philippians 2 is sometimes titled "Imitating Christ's Humility", where humility is not a lack of self-worth. Rather, it is putting to death selfish desires and vain conceit. -being obedient. "If you love me, you will obey my commandments." John 14:15. Yes, that also means to pick up your cross daily and follow him. -being gracious. Colossians 4:6 says, "Let your conversations be always full of grace, seasoned with salt, so that you may know how to answer everyone." I think that also entails being well immersed in the Word. 3 ways: Through our conversation - similar to what was stated above, but also holding our conversation topics to a higher standard. Being positive - There is so much negativity in this world and in people's attitude's right now. We have so much to be thankful and excited for that we should try to be positive around others. To become a catalyst within our paradigm. To not necessarily change things, but to be the ones that causes drastic change in peoples characters.